Chandigarh Sep 15 (IANS) Bishop Franco Mulakkal who has been named in a sexual abuse case by a senior nun is likely to join an ongoing investigation into the matter with the Kerala Police soon and will hand over charge of his Diocese to his second-in-command during his absence. "It is reported that I am likely to be called for further clarifications by the Investigating Officer in Kerala. 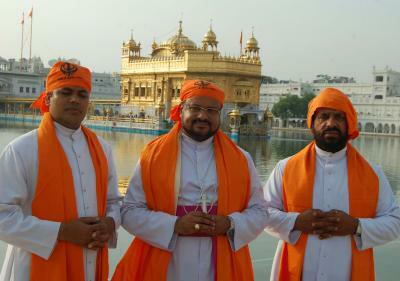 I request you to continue to pray for me and for the alleged victim and her supporters who have come out against me so that divine intervention may bring about change of heart and the truth of the matter may be revealed " Mulakkal of the Roman Catholic Diocese in Jalandhar said in a statement. "I leave everything into the hands of God as I await the result of the findings of the team probing the allegation. In my absence Msgr. Mathew Kokkandam will administer the Diocese as is the normal practice when I am away." Mulakkal has been served a notice to appear before the probe team on September 19. He got a breather from the Kerala High Court on Thursday as it said that the "arrest (of the Bishop) is not the issue". Expressing satisfaction over the ongoing probe the court observed that since it was an old case the probe and the investigation will take time and "not the arrest but final punishment of the accused is more important". However the nuns supporting the victim have expressed their disappointment with the court s observation. The victim has accused Mulakkal of repeatedly sexually abusing her between 2014 and 2016. There are five other nuns of the same congregation who have supported her claim.